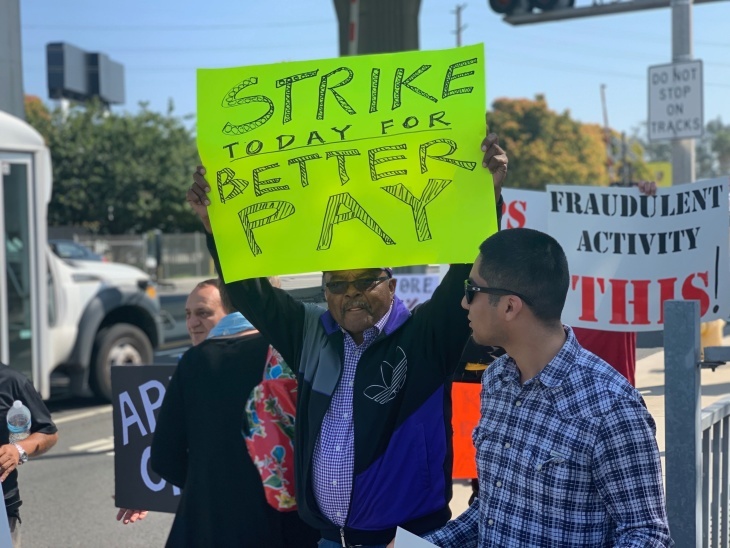 Hundreds of rideshare drivers are striking for 25 hours at Uber's Redondo Beach offices to ask for higher wages, following the rideshare company's recent percentage cut on per-mile pay. The organizers, Rideshare Drivers United Los Angeles (RHU-LA), are asking for a reversal of a 25 percent pay cut and demanding that all rideshare platforms, including Lyft, guarantee drivers a $28 per hour minimum, a gas-price surcharge and new vehicle emissions standards. The group is urging customers to use public transportation in solidarity for the duration of the 25-hour strike. The organizers said that Uber announced the new pay cuts on March 11, dropping the mileage rate from 80 to 60 cents per mile. The company said they were compensating for that change by raising the per minute rate by 16 percent. But James Hicks, an Uber driver and organizing member of RHU-LA, said that rideshare drivers make their bread and butter from mileage, not time, and that the announcement took them by surprise. "When we opened the app on March 11, there were new terms of agreement," Hicks said. "If you don't accept those terms, you can't work. A lot of us need to work, because it's our full-time gig, but we don't have any power to negotiate." Drivers chanted "Stand up, fight back" and carried signs with handwritten demands like "Restore our 25 percent and dignity" and "Innovation without poverty." The protestors briefly closed down Marina Avenue before police urged them back onto the sidewalk. "It's debilitating," said Mateo Nagassi, one of the protestors. He lives in downtown L.A. and has been driving for Uber for five months. "We just have to unionize as any young industry has done. Somebody needs to stick up for us." Jacklyn is an @Uber driver who also rents a car from the company. But she says she's losing 1/3 of her pay with the car's rental fee and car upkeep. The protest comes on the heels of Uber and Lyft preparing to launch competing IPOs, which will likely make investors very, very rich. Meanwhile, many Lyft and Uber drivers say they can barely make ends meet, especially in a city with a high cost of living like L.A.
Several protesters said that it's hard to tell if their income has fallen significantly since the 25 percent cuts, because the change happened so recently. "I haven't done a comparison on whether the pay change works out better or worse," said Daniel Nolte, who drives Uber and Lyft for 8-12 hours a day and decided not to strike. "This week was pretty typical compared to last week." The cuts are, however, part of a pattern of declining pay for drivers nationwide, that's been going on for the past several years. "When I started working for Lyft two years ago, I would put in 8-10 hours in a night and bring home $150-$200," said Nicole Moore, one of the Rideshare Drivers United organizers. "I put in 10 hours last Friday night. I brought home $90." "Any time you're messing with a driver's pay, you're messing with their livelihood," said Harry Campbell, founder of The Rideshare Guy, via email. "I hear from drivers all the time who want to organize a strike and protest against Uber, but unfortunately, it's a difficult proposition. Outside of places like N.Y.C., where there are way more full time drivers, it's hard to get the word out amongst drivers since most are not on social media and that's typically where these strikes are organized." In a statement, an Uber spokesperson told LAist that they are changing the per-minute, per-mile and minimum fare rates, which will make the overall rates comparable to where they were in September. But the company did not offer any details on what those rates will be. The strike started on Monday at midnight and is planned to last until 1 a.m. Tuesday.